In a probe initiated by Jersey City Mayor Steven Fulop and Public Safety Director James Shea, as many as a dozen Jersey City police officers may been arrested in connection with an alleged private security scheme. Although rumored for months, the arrests appear imminent, according to a report from a New York-based TV network. Sources close to the investigation said this was something initiated by the city and the city is working closely with federal authorities on the matter. “Over the last three years this administration has initiated and worked with federal authorities in several investigations to root out corruption by long-term city employees. We have a zero tolerance policy and employees should be aware that if they break the law they will be held accountable,” said city spokeswoman Jennifer Morrill. The scheme allegedly involved off-duty work assignments on street construction and other sites, and possible falsification of time sheets. Off-duty police officers are allowed to work security for private companies, although the process is monitored by the city. The city sets fees for officers as well as supervisors. The city is supposed to collect the fees then distribute the money to the officers. But in some cases, officers may not have bothered to report these jobs to the city and allegedly look direct payments. A local Cub Scouts pack reportedly said that a transgender Secaucus boy cannot stay in the group because he was born female, North Jersey.com reported. Joe Maldonado had belonged to Cub Scout Pack 87 for a month before a scouting official called his mother with the news. Though Joe’s status was well known and he was accepted in the pack, parents reportedly complained about him. Both Cub Scout Pack 87 and Kristie Maldonado did not respond to requests for comment by press time Wednesday. To comment on this story, or if you have more information, email editorial@hudsonreporter.com. UNION CITY — The Union City Police Department is mourning the loss of a veteran officer who suddenly died Monday evening. Officer Ricardo “Ricky” Fernandez, 48, suffered an undisclosed “medical emergency” at his Old Bridge home, Police Captain Nichelle Luster said today. Fernandez had 24 years on the job, having graduated from the police academy in 1993. He leaves behind a wife and two children. A memorial service for Fernandez is in the planning stages. Watch next week’s newspaper for more information. Hudson Civic Action, a local non-partisan citizen advocacy group, holds monthly meetings the second Tuesday of every month, 6:30 p.m. at Good Shepherd Lutheran Church, 8 Columbia Terrace, Weehawken. Get engaged with your community and local government. RSVP to info@hudsoncivicaction.org. Also, the group is planning four community workshops in 2017. The first will be “Know Your Rights” training with the ACLU, which will be presented twice, once in English, once in Spanish. Could modern bumpers have mitigated the Hoboken train crash? According to the Associated Press, experts said recently that more modern bumpers in the Hoboken train terminal might have lessened the impact in the deadly Sept. 29 commuter train crash. The bumpers with hydraulic shock absorbers and friction shoes are used in Atlantic City, but not in Hoboken, where the same concrete and steel bumpers have been used since 1907. Experts said the more modern bumpers wouldn’t have been able to stop the train that crashed into Hoboken terminal at 21 mph, but might have slowed it and lessened the damage. The fatal crash injured over 100 people and killed Hoboken mother Fabiola Bittar de Kroon, 34. Only one of the tracks at Hoboken terminal has had a bumper replaced. The others still feature the concrete and steel stationary bumpers. Steven Santoro, NJ Transit executive director, told the Associated Press NJ Transit is currently in the process of hiring a consultant to review the bumping posts at Hoboken to help determine whether they need to be replaced. Santoro said including bumping posts with friction shoes could potentially cause train overcrowding as they would need to be placed farther away from the track’s end. “Had there been something in place that would absorb some of the kinetic energy of the train, therefore there may have been less damage to the structure and that piece may not have fallen? That’s certainly possible,” said train expert Gus Ubaldi. According to the AP, federal investigators are examining how the bumping post in Hoboken performed compared to one in a similar accident at Chicago’s O’Hare Airport in 2014. To read our prior coverage, look under “Hoboken news” at hudsonreporter.com. North Bergen officials are still trying to determine what sparked a five-alarm fire at a local furniture store. The blaze happened Dec. 21st at Kennedy Furniture on John F. Kennedy Boulevard and 13th Street. It took over three hours for the North Hudson Regional Fire and Rescue to bring it under control. He added that he believes the fire was accidental. The fire completely destroyed the building, leaving it a pile of steel and burned debris in its aftermath. West New York officials are investigating the cause of an electrical fire that broke out inside a 26-story high-rise at 5601 Boulevard East on Tuesday, according to local media reports. They quoted Deputy Fire Chief Nick Gazzillo of North Hudson Regional Fire & Rescue as saying there were “four spot fires” after a report of an explosion on the eighth floor of the Overlook Terrace South tower. Gazzillo said there were no serious injuries, although several residents were treated at the scene. West New York Mayor Felix Roque, who was at the scene, said, “We’re just happy everyone’s alive and well.” Traffic was backed up around the area as Boulevard East was shut down between 54th and 60th streets. To encourage local shopping this holiday season, the city of Hoboken is offering up to four hours of free garage parking in municipal garages B (28 Second St.), D (215 Hudson St.), and Midtown (371 Fourth St.) on Saturday, Dec. 31and Sunday, Jan. 1for visitors who come to Hoboken to shop or dine. Parking meters are free on Sundays. The city offered the same service this past weekend for holiday shopping. 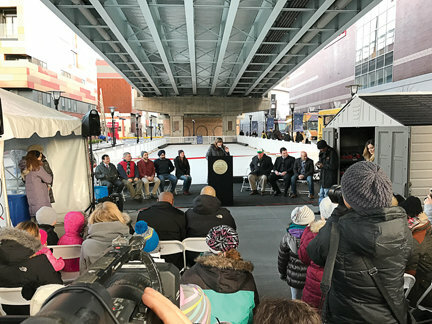 Hoboken’s new seasonal ice skating rink officially opened Thursday Dec. 22 under the 14th Street Viaduct between Grand and Adams Streets and will operate until the end of February. The rink is sponsored by Advance Realty, the developer of the Harlow apartment building at 1330 Willow Ave. The 3,100 square foot rink uses synthetic ice which is designed for skating with regular metal-blade ice skates and is slightly slower than ice. Admission is free and visitors may bring their own skates, or rent at $10 for adults and $5 for children 10 and under. Vendors and skate rentals are cash only. over 12 percent of the township’s arrests for 2015 came from Walmart. In response, the town is considering permanently placing a police officer inside the store. Mayor Michael Gonnelli plans to meet with store officials to discuss security measures in early 2017. Mayor Nicholas Sacco, alongside Commissioners Hugo Cabrera and Julio Marenco, held the annual North Bergen Toy Drive at the town’s Recreation Center Dec. 22. Approximately 250 families picked up free gifts for their kids– around 800 young ones in total. Each family also received a chicken and a bag of sides. NB C.A.R.E.S (Community Assistance Relief Events and Support), a relief program to assist displaced North Bergen residents, worked with the North Bergen Police Department and the North Bergen Board of Education to gather the toys in November at various town locations. The town also gave 400 seniors at the center cooked meals. PBA Local 18 and 18A both contributed funds for the drive. Additional contributors included Avalon Bay, Bar One, Bottle Co., and Broadway Pharmacy. A local Walgreens donated many of the toys and gifts. Leftover items after the drive were donated to local charities and/or the relief center. Learn how to become a CASA (Court Appointed Special Advocate) volunteer and help foster children find safe and permanent homes. You may attend an information session at the Hudson County Courthouse, 595 Newark Ave. Room 901, on Tuesday, Jan. 10 at 6:30 p.m. Hudson County Court Appointed Special Advocates (CASA) is a non-profit organization committed to advocating for the best interests of abused and neglected children. CASA works through trained community volunteers to ensure that needed services and assistance are made available to children while helping to move them toward safe and permanent homes. Hudson County CASA volunteers are everyday people who make a direct impact in foster children’s lives. They are trusted, dedicated adults who seek to improve children’s well-being. CASA volunteers get to know their assigned child and his or her circumstances and provide valuable information to the court. Judges rely on the volunteers’ recommendations to make the best decisions about the children’s futures. Weehawken resident Theresa Borrelli has published her second children’s book, “Ariel’s Home Adventures.” This is Borrelli’s eight book, and includes a musical spoken word/poetry CD. “Ariel’s Home Adventures” and her other works may be found on Amazon.com, Barnesandnoble.com, Booksamillion.com and other sites and venues. “Ariel’s Home Adventures” is available in ebook format at Xlibris.com. Borrelli is available to read and entertain at schools, libraries, and day care centers, and may be reached at tb49borrelli@gmail.com. Next PostNext KILLOUGH, SISTER MAUREEN.